In these surveys, you upload your respondent database in WebHost, but survey responses are not linked to a given respondent. Respondents are not tracked to identify whether they have responded, although if a respondent opts out of the survey WebHost will record this to ensure that they do not receive reminder emails. A unique email address for each respondent. Open a survey in Snap Professional. 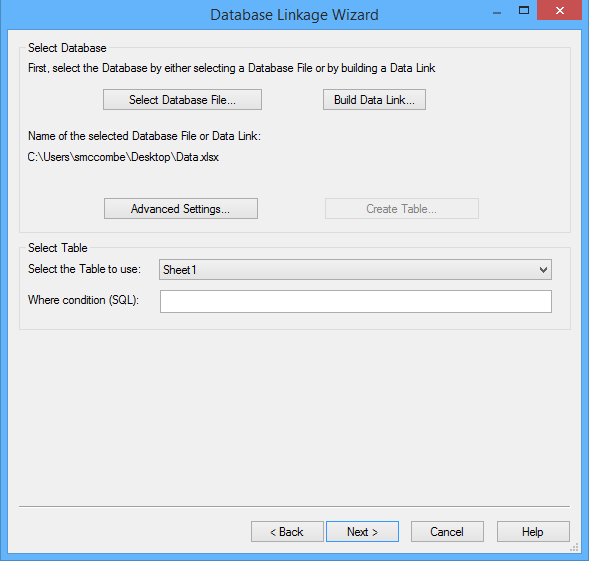 Click on the toolbar or select File | Database Link to display the Database Linkage dialog box. Click New to create a new database link. 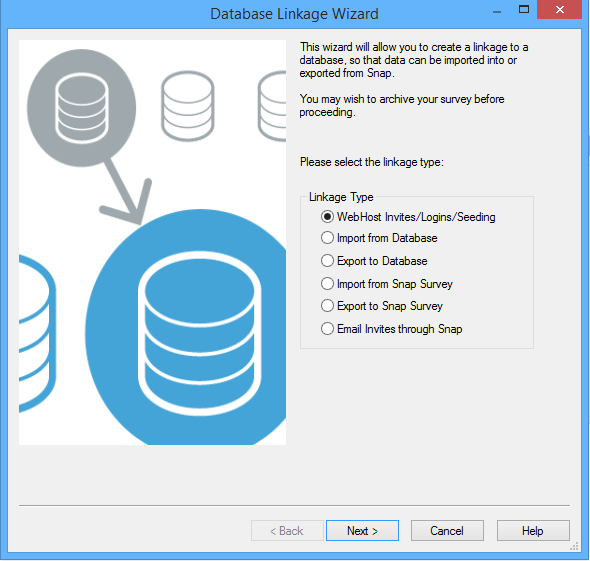 The Database Wizard dialog is displayed. Select WebHost Invites/Logins/Seeding option. Click Next to select the database file. Click Select Database File... and browse to the Excel or MS Access file containing the respondent email address, Click Next. As WebHost will not be tracking responses select Send email invitations only. Click Next. Tell WebHost which database field contains the respondent email address. Allows you to design an email that will be uploaded to WebHost – you can also design the email in WebHost. Check the Use HTML emails if you wish to have styled HTML emails. Set the Email address field option; select the appropriate unique email address from the drop down menu. Add a subject heading in the Email subject and text box. Insert a survey location using the Insert | Survey Location option. 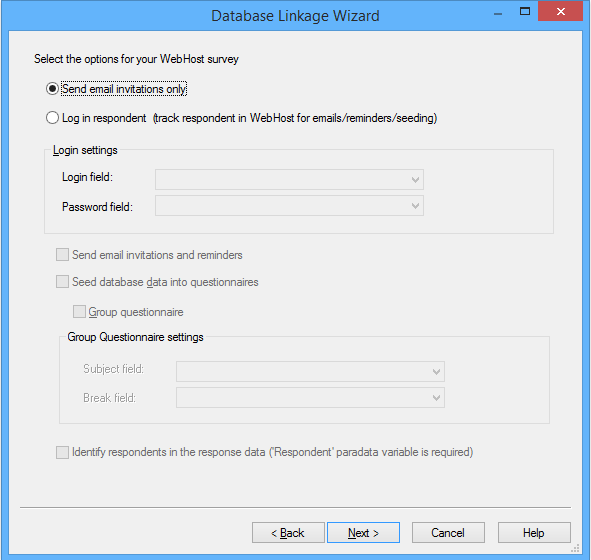 The Link Text will change the text of the displayed survey location. 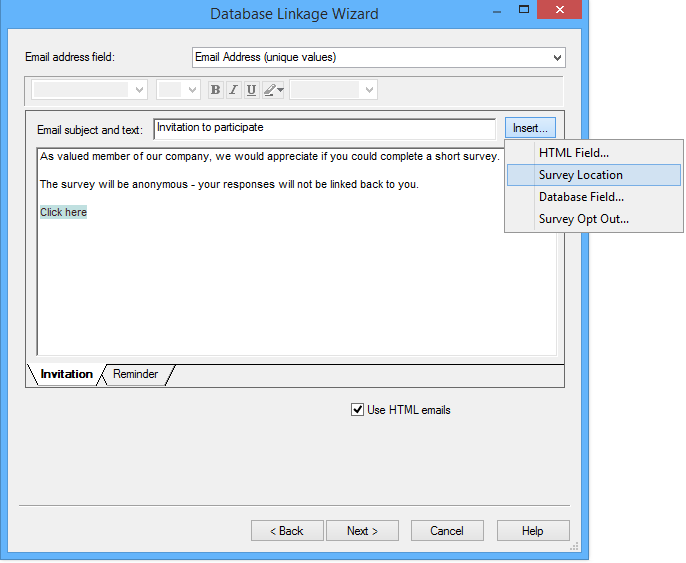 Insert a link enabling your respondents to opt out of the survey using the Insert | Survey Opt Out option. You can also insert additional information from your database using the Insert | Database Field option. You can make changes or add additional design elements to the email invite when the survey has been uploaded to WebHost. The Reminder text is copied automatically from the initial invite. Click Next. You will see a summary of what the database link does. Give the database link a name. Select Finish and Close – there is no need to click Run. The survey is now ready to be published and uploaded to Snap WebHost.